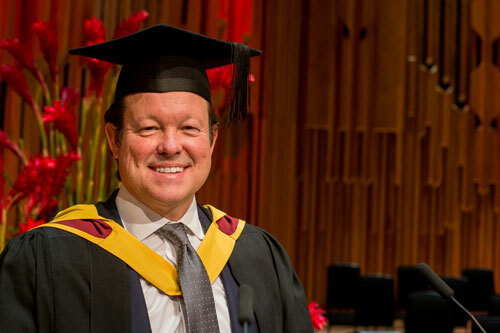 David Long (EMBA, 2019) was the student speaker at the City, University of London graduation ceremony at the Barbican on Tuesday 22nd January 2019. David is an experienced banker who rose to be Chief Operating Officer at the European end of a global investment bank and a board member of the British Bankers Association. Following his successful completion with distinction of his Executive MBA, David sought a change in his career path creating a risk consultancy business which was sold within very soon afterwards to a larger business where David is now a partner. Speaking at the ceremony, Professor Steve Thomas, Associate Dean, MBA Programmes paid tribute to David’s hard work throughout his EMBA, his collegiality and his support and mentorship of fellow students. An edited extract of David’s graduation address is below. “On behalf of all my fellow students graduating today from both Cass Business School and the School of Arts and Social Sciences, I want to say thank you for celebrating this special day with us. “Today we each achieve the goal that we set ourselves. We are graduating with Bachelor’s degrees, Master’s degrees, Post Graduate Diplomas and PhDs – and it’s a goal that we can all be truly proud of reaching. “I chose to study for an MBA late in life due to a new-found passion for learning. For me this was a wonderful self-indulgence, immersing myself in some familiar subjects and many new and challenging ones. “My fellow MBA cohort members chose to study for a variety of reasons; some were entrepreneurs who wanted to improve how they ran their businesses, and others had entrepreneurial ambitions and wanted to arm themselves with business skills to start out on their own. Many were here to progress their careers in large corporations, and others were seeking a career change. “At the start of the course I remember being told that on the Executive MBA half of the teaching would come from my fellow cohort. I struggled to imagine this. I didn’t see how students could possibly provide half of the learning. How could we possibly teach each other as much as the lecturers and professors? “Having finished the course, I now understand. The lecturers provided the facts, the ideas and in many cases the inspiration for the subject. We the students assimilated and digested the facts together. “We naturally discussed what we were taught – we discussed it in class, we discussed it at lunch and we discussed it on the way home. We collaborated on assignments and we revised together. And it was during these acts of collaboration that we really processed all the facts and information given to us, and it was often during these moments of working together that we would have our ‘aha’ moments and grasp the concepts. “Firstly, how fast time flies. In this room we have spent the last one to four years studying. I studied for two years and those two years I spent with my class went so fast. Too fast. I blinked, and it was over. There were so many great times - thank you! “Secondly, that we had so many great times - the friendships and the exposure to new subjects and different cultures. “And, finally, we had many tough times too. It was tough to find time to fit in all the work. It was tough to complete the assignments on time. It was tough to revise - and even tougher to sit the exams. “In closing, I’d like to say thank you. “I’d like to thank the faculty and staff for the great education we received, for the wonderful experiences you gave us and for all your help. “I’d like to thank all our friends and families for their support and patience. “But the biggest thank you goes to my cohort – thank you for being the best class ever! I don’t know if every class feels this way, but we were truly special, we were awesome. “I’m sad it’s all over, but at least when we get together from now on it won’t be to do assignments or revise for exams!